Synopsis: When a teenage girl is possessed by a mysterious entity, her mother seeks the help of two priests to save her daughter. Review: I remember when I was finally allowed to rent The Exorcist on VHS from our local video store after several months of asking (aka begging) my parents to see it. When they finally relented, my dad delivered the caveat that it was the ‘scariest film ever’…which only made me hop on my bike faster to make it to Home Video before sundown. I have to admit that my first impression of The Exorcist was disappointment because I found the film more funny than scary. I mean, a girl pees her pants, swears a blue streak at anyone that gets near her, and she pukes a green soupy rainbow over a priest. In my defense, at the time all I was interested in when it came to horror were masked killers, marauding sharks, and the gorier the film was the better. While The Exorcist had its fair share of icky moments, there wasn’t enough of the red stuff to make it worth my while…I actually laughed more at the crazy swears coming out of the young and possessed Linda Blair. Now thankfully over time my taste for subtle horror has developed and my understanding of cinematic technique has increased so The Exorcist means something very different to me now. Though I never saw the film during its theatrical run (I wasn’t born yet, thank you very much) the film did show on network television, albeit heavily censored, the night I was born…coincidence?…my babysitters wouldn’t think so. It’s next to impossible to watch the film without having its many spoofs and rip-offs influencing your enjoyment so it’s best to just acknowledge that the film inspired a whole demonic possession streak of films and countless other moments that populate the cultural lexicon of our understanding. Once that’s taken care of, you can take the film for what it is…a true genre classic that takes its sweet time to unfold until it finally unleashes some lasting moments of terror that will stay with you throughout the night. William Peter Blatty won an Oscar for adapting his hit novel surrounding a Georgetown pre-teen (Blair, Hell Night) that becomes possessed by an ancient evil. Her actress mother (Ellen Burstyn, Interstellar) runs out of options and finally calls on the services of the titular character (Max von Sydow, Extremely Loud and Incredibly Close, Never Say Never Again) and a local priest (Jason Miller) to cast out the force that’s destroying her daughter. Though the film jumps continents, director William Friedkin (Killer Joe) stages the film almost like a play (it actually was adapted for the stage in 2012) with the majority of the action taking place in the bedroom of the young girl. Also winning an Oscar for sound (it was nominated for 10 total), all the elements come together to put the audience through the wringer and I can’t imagine how scary the movie must have been to viewers in the early 70’s just coming out of the hippy dippy peace movements. Watching the film recently I was reminded at how level Friedkin and Blatty keep the movie, rarely straying into cheap scares or overly effusive dialogue. The entity of evil is treated with an aura of respect and understanding which makes it all the freakier when the youngster is subjected to its grisly whims. I’ve always found the ending of the film to be the tiniest bit of a letdown when you consider all that came before it…if you happen to look away for a moment (no one would blame you), you may miss a key wrap up development that influences the rest of the picture. 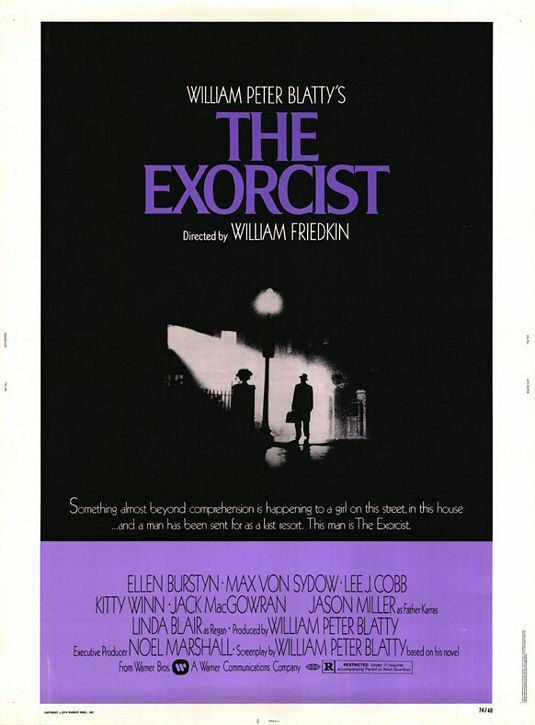 That minor quibble aside, on its 40th birthday The Exorcist is still celebrated for bringing horror stylishly into the mainstream…even being nominated for Best Picture at The Oscars where it was beaten by The Sting (I have a feeling it would have won had the Academy been a bit more forward thinking). If it’s been a while since you’ve taken it in or if you’ve somehow never seen the film you owe it to yourself to give it a look…just throw away all your cans of pea soup first.